Dymet Alloys produces tungsten carbide material binder grades tailored to meet the demands for wear resistant and durable press tooling for a wide range of manufacturing and engineering sectors. We manufacture a wide range of bespoke press tooling components, including high cobalt heading dies inserts, piercing dies, deep drawing dies, extrusion dies, stamping tools and punches. Individual tungsten carbide parts can be supplied either as an as-sintered pre-form, or as a finished ground component to meet a customer’s specific requirements. 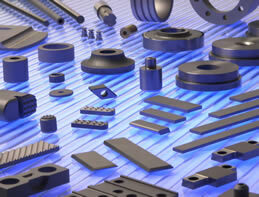 Tungsten carbide sintered pre-forms can be supplied in a variety of shapes and profiles. Die insert blanks can be supplied individually or encased within a steel outer housing with the internal profile finished as required. Working to customer specifications and component drawings, we can supply individual parts in the as-sintered condition or finished with ground, EDM spark eroded, wire or polished profiles as required. We can manufacture a wide range of press tooling components and tooling wear parts, and we invite customers to enquire about the range of tungsten carbide material grades and binders we produce and our in-house processes. We welcome the opportunity to give advice on the selection of the most suitable grade of tungsten carbide material for your application and we can give comment, advice and initial pricing to help you design your new tooling requirements.